Greatest extent of the Visigothic Kingdom, c. 500 (shown in orange, territory lost after Vouille shown in light orange). 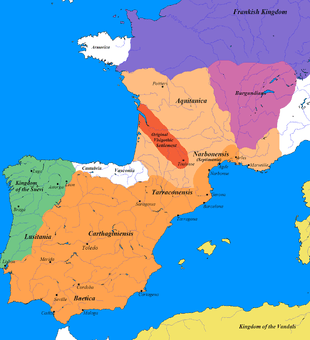 The Visigothic Kingdom or Kingdom of the Visigoths (Latin: Regnum Visigothorum; Gothic: Gutþiuda Þiudinassus) was a kingdom that occupied what is now southwestern France and the Iberian Peninsula from the 5th to the 8th centuries. 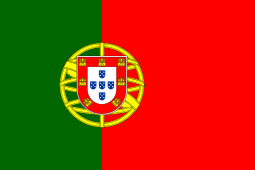 One of the Germanic successor states to the Western Roman Empire, it was originally created by the settlement of the Visigoths under King Wallia in the province of Aquitaine in southwest France by the Roman government and then extended by conquest over all of the Iberian Peninsula. The Kingdom maintained independence from the Eastern Roman or Byzantine Empire, the attempts of which to re-establish Roman authority in Iberia were only partially successful and short-lived. Sometimes referred to as the regnum Tolosanum or Kingdom of Toulouse after its capital Toulouse in modern historiography, the kingdom lost much of its territory in Gaul to the Franks in the early 6th century, save the narrow coastal strip of Septimania, but the Visigoth control of Iberia was secured by the end of that century with the submission of the Suebi. The kingdom of the 6th and 7th centuries is sometimes called the regnum Toletanum after the new capital of Toledo. The ethnic distinction between the indigenous Hispano-Roman population and the Visigoths had largely disappeared by this time (the Gothic language lost its last and probably already declining function as a church language when the Visigoths converted to Catholicism in 589). Liber Iudiciorum (completed in 654) abolished the old tradition of having different laws for Romans and for Visigoths. Most of the Visigothic Kingdom was conquered by Arab Umayyad troops from North Africa in 711 AD, with only the northern reaches of Spain remaining in Christian hands. These gave birth to the medieval Kingdom of Asturias when a local landlord called Pelayo, most likely of Gothic origin, was elected Princeps by the Astures. The Visigoths and their early kings were Arians and came into conflict with the Catholic Church, but after they converted to Nicene Christianity, the Church exerted an enormous influence on secular affairs through the Councils of Toledo. The Visigoths also developed the highly influential law code known in Western Europe as the Liber Iudiciorum, which would become the basis for Spanish law throughout the Middle Ages. From 407 to 409 AD, the Germanic Vandals, with the allied Alans and Suebi, crossed the frozen Rhine and swept into the Iberian peninsula. For their part, the Visigoths under Alaric famously sacked Rome in 410, capturing Galla Placidia, the sister of Western Roman emperor Honorius. Ataulf (King of the Visigoths from 410 to 415), spent the next few years operating in the Gallic and Hispanic countrysides, diplomatically playing competing factions of Germanic and Roman commanders against one another to skillful effect, and taking over cities such as Narbonne and Toulouse (in 413). After he married Placidia, the Emperor Honorius enlisted him to provide Visigothic assistance in regaining nominal Roman control of Hispania from the Vandals, Alans and Suevi. In 418, Honorius rewarded his Visigothic federates under King Wallia (reigned 415-419) by giving them land in the Garonne valley of Gallia Aquitania on which to settle. This probably took place under hospitalitas, the rules for billeting army soldiers. It seems likely that at first the Visigoths were not given a large amount of land estates in the region (as previously believed), but that they acquired the taxes of the region, with the local Gallic aristocrats now paying their taxes to the Visigoths instead of to the Roman government. The Visigoths with their capital at Toulouse, remained de facto independent, and soon began expanding into Roman territory at the expense of the feeble Western empire. Under Theodoric I (418–51), the Visigoths attacked Arles (in 425 and 430) and Narbonne (436), but were checked by Flavius Aetius using Hunnic mercenaries, and Theodoric was defeated in 438. By 451, the situation had reversed and the Huns had invaded Gaul; now Theodoric fought under Aetius against Attila the Hun in the Battle of the Catalaunian Plains. Attila was driven back, but Theodoric was killed in the battle. The Vandals completed the conquest of North Africa when they took Carthage on October 19, 439 and the Suevi had taken most of Hispania. The Roman emperor Avitus now sent the Visigoths into Hispania. Theodoric II (453–66) invaded and defeated the King of the Suevi, Rechiarius, at the battle on the river Orbigo in 456 near Asturica Augusta (Astorga) and then sacked Bracara Augusta (Braga) the Suevi capital. The Goths sacked the cities in Spain quite brutally: they massacred a portion of the population and even attacked some holy places, probably due to the clergy's support of the Suevi. Theoderic took control over Hispania Baetica, Carthaginiensis and southern Lusitania. In 461, the Goths received the city of Narbonne from the emperor Libius Severus in exchange for their support. This led to a revolt by the army and by Gallo-Romans under Aegidius; as a result, Romans under Severus and the Visigoths fought other Roman troops, and the revolt ended only in 465. Theodoric I by Fabrizio Castello (1560-1617). In 466, Euric, who was the youngest son of Theodoric I, came to the Visigothic throne. He is infamous for murdering his elder brother Theodoric II who had himself become king by murdering his elder brother Thorismund. Under Euric (466–84), the Visigoths began expanding in Gaul and consolidating their presence in the Iberian peninsula. Euric fought a series of wars with the Suebi who retained some influence in Lusitania, and brought most of this region under Visigothic power, taking Emerita Augusta (Mérida) in 469. Euric also attacked the Western Roman Empire, capturing Hispania Tarraconensis in 472, the last bastion of Roman rule in Spain. By 476, he had extended his rule to the Rhone and the Loire rivers which comprised most of southern Gaul. He also occupied the key Roman cities of Arles and Marseilles. In his campaigns, Euric had counted on a portion of the Gallo-Roman and Hispano-Roman aristocracy who served under him as generals and governors. The Visigothic Kingdom was formally recognized when the Western emperor Julius Nepos (473–480) signed an alliance with Euric, granting him the lands south of the Loire and west of the Rhone in exchange for military service and the lands in Provence (including Arles and Marseilles). 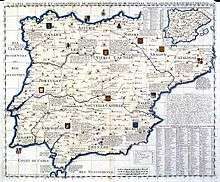 The lands in Hispania remained under de facto Visigothic control. After Odoacer deposed the last Roman emperor in the West, Romulus Augustulus, Euric quickly recaptured Provence, a fact which Odoacer formally accepted in a treaty. After Alaric II's death, his illegitimate son Gesalec took power until he was deposed by Theodoric the Great, ruler of the Ostrogothic Kingdom, who invaded and defeated him at Barcelona. Gesalic fled and regrouped, but was defeated again at Barcelona, and was captured and killed. Theodoric then installed his grandson Amalaric (511–31), the son of Alaric II, as king. Amalaric, however, was still a child and power in Spain remained under the Ostrogothic general and regent, Theudis. Only after Theoderic's death (526) did Amalaric obtain control of his kingdom. His rule did not last long, as in 531, Amalaric was defeated by the Frankish king Childebert I and then murdered at Barcelona. Afterwards, Theudis (531–48) became king. He expanded Visigothic control over the southern regions, but he was also murdered after a failed invasion of Africa. Visigothic Spain suffered a civil war under King Agila I (549–54), which prompted the Roman/Byzantine emperor Justinian I to send an army and carve out the small province of Spania for the Byzantine Empire along the coast of southern Spain. Agila was eventually killed, and his enemy Athanagild (552–68) became the new king. He attacked the Byzantines, but he was unable to dislodge them from southern Spain, and was obliged to formally acknowledge the suzerainty of the Empire. 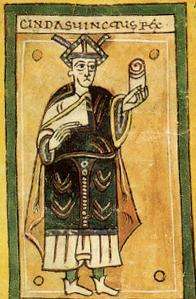 The next Visigothic king was Liuvigild (569 - April 21, 586). He was an effective military leader and consolidated Visigothic power in Spain. Liuvigild campaigned against the Romans in the south in the 570s and he took back Cordova after another revolt. He also fought in the north against the Suebi and various small independent states, including the Basques and the Cantabrians. He pacified northern Spain, but was unable to completely conquer these peoples. When Liuvigild established his son Hermenegild as joint ruler, a civil war ensued between them. 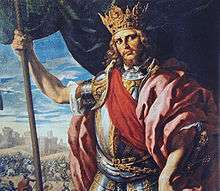 Hermenegild became the first Visigothic king to convert to Nicene Christianity due to his ties with the Romans, but he was defeated in 584 and killed in 585. By the end of his reign, Liuvigild had united the entire Iberian peninsula, including the Suebic Kingdom which he conquered in 585 during a Suebi civil war that ensued after the death of King Miro. Liuvigild established amicable terms with the Franks through royal marriages, and they remained at peace throughout most of his reign. Liuvigild also founded new cities, such as Reccopolis and Victoriacum (Vitoria), the first barbarian king to do so. On becoming King, Liuvigild's son Reccared I (586–601) converted from Arian to Chalcedonian Christianity. This led to some unrest in the kingdom, notably a revolt by the Arian bishop of Mérida which was put down; he also beat back another Frankish offensive in the north. Reccared I then oversaw the Third Council of Toledo in 589, where he announced his faith in the Nicene creed and denounced Arian. He adopted the name Flavius, the family name of the Constantinian dynasty, and styled himself as the successor to the Roman emperors. Reccared also fought the Byzantines in Hispania Baetica after they had begun a new offensive. In 711, Tariq ibn Ziyad, a Muslim Berber client of Musa bin Nusair, the governor of Islamic Africa, invaded Spain with about 7,000 men, while Roderic was in the north fighting the Basques. The tale of Julian, Count of Ceuta facilitating the invasion, because one of his daughters had been dishonored by Roderic, is both late and mythical. By late July, a battle took place at the Guadalete River in the province of Cádiz. Roderic was betrayed by his troops, who sided with his enemies, and the king was killed in battle. The Muslims then took much of southern Spain with little resistance, and went on to capture Toledo, where they executed several Visigothic nobles. In 712, Musa, the governor of Ifriqiya, arrived with another army of 18,000, with large Arab contingents. He took Mérida in 713 and invaded the north, taking Saragossa and León, which were still under King Ardo, in 714. After being recalled by the Caliph, Musa left his son Abd al-‘Aziz in command. By 716, most of the Iberian Peninsula was under Islamic rule, with Gallia Narbonensis taken between 721 and 725. The only effective resistance was in Asturias, where a Visigothic nobleman named Pelagius (Pelayo) revolted in 718, allied with the Basques and defeated the Muslims at the battle of Covadonga. 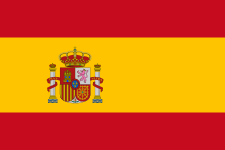 Resistance also continued in the regions around the Pyrenees and the mountainous regions of northern Spain, where the Muslims were uninterested or unable to establish their authority. 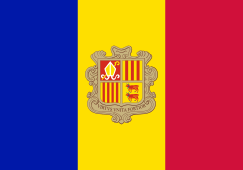 The Berbers settled in the south and the Meseta Central in Castile. Initially, the Muslims generally left the Christians alone to practise their religion, although non-Muslims were subject to Islamic law and treated as second-class citizens. Visigothic settlement was concentrated along the Garonne River between Bordeaux and Toulouse in Aquitaine, and later in Spain and Portugal around the Ebro River, around the city of Mérida, between the upper reaches of the Douro River, in Tierra de Campos also known as Campi Gothorum in Central Castile and León, Asturias and Toledo, and along the Tagus River north of Lisbon. Little Visigothic settlement occurred elsewhere in the kingdom. These kings and leaders — with the exception of Fritigern and possibly Alavivus — were pagans. These kings were Arians (followers of the theological teaching of Arius). They tended to succeed their fathers or close relatives on the throne and thus constitute a dynasty. ↑ Cameron, Ward; Perkins and Whitby. The Cambridge Ancient HIstory - Volume XIV. Late Antiquity: Empire and Successors, A.D. 425–600. p. 48. .
↑ Cambridge Ancient v. 14, p. 113. ↑ David Abulafia et al. The New Cambridge Medieval History, Volume 1 c. 500 – c. 700, p. 165. ↑ Cambridge Ancient v. 14, p. 24. ↑ NC Medieval v. I, p. 167-171. ↑ Cambridge Ancient v. 14, p. 113-114. ↑ Charles William Previté-Orton, The Shorter Cambridge Medieval History, (Cambridge University Press, 1979), 145. ↑ NC Medieval v. I, p. 183 - 209. ↑ Cambridge Ancient v. 14, p. 122-124. ↑ NC Medieval v. I, p. 346-350. ↑ NC Medieval v. I, p. 350-353. ↑ NC Medieval v. I, p. 356-360. ↑ NC Medieval v. I, p. 360-369. ↑ NC Medieval v. I, p. 369-370. ↑ David Abulafia et al. The New Cambridge Medieval History, Volume II c. 700 — c. 900, p. 256-58, 275-276. 1 2 3 Thompson, "The Barbarian Kingdoms in Gaul and Spain". ↑ Lacarra, "Panorama de la historia urbana en la Península Ibérica desde el siglo V al X," La città nell'alto medioevo, 6 (1958:319–358), in Estudios de alta edad media española, p. 48.